Adding/removing streams of a file without recompressing the other streams. The precise codec must be known to gavl. While for decoding it never matters if we have MPEG-1 or MPEG-2 video (libmpeg2 decodes both), for compressed I/O it must be known. For some codecs, we need other parameters like the bitrate or if the stream contains B-frames or field pictures. Each audio packet must consist of an independently decompressable frame and we must know, how many uncompressed samples are contained. For each video packet, we must know the pts, how long the frame will be displayed and if it's a keyframe. An info structure, which describes the compression format (i.e. the codec). The actual codec is an enum (similar to ffmpegs CodecID), but other parameters can be required as well (see above). A structure for a data packet. Both of these are in gavl in a new header file gavl/compression.h. Gavl itself never messes around with the contents of compressed packets, if just provides some housekeeping functions for packets and compression definitions. The definitions were moved here, because it's the only common dependency of gmerlin and gmerlin-avdecoder and I didn't want to define that twice. They can be called after the track was selected with bgav_select_track(). If the demuxer doesn't meet the above goals for a stream it's tried with a parser. If there is no parser for this stream, compressed output fails and the functions return 0. There is a small commandline tool bgavdemux, which writes the compressed packets to raw files, but only if the compression supports a raw format. This is e.g. not the case for vorbis or theora. All filters are however completely ignored. You can configure any filters you want, but when you choose to copy the stream, none of them will be applied. If a stream cannot be copied, it will be transcoded. Another major project was support in libquicktime. It's a bit nasty because libquicktime codecs do tasks, which should actually be done by the (de)multiplexer. In practice this means that compressed streams have to be enabled for each codec and container separately. The public API is in compression.h. It was modeled after the functions in libgmerlin, but the definition of the compression (lqt_compression_info_t) is slightly different because inside libquicktime we can't use gavl. I made a small tool lqtremux. It can either be called with a single file as an argument, in which case all A/V streams are exported to separate quicktime files. If you pass more than one file on the commandline, the last file is considered the output file and all tracks of all other files are multiplexed into the output file. Note that lqtremux is a pretty dumb application, which was written mainly as a demonstration and testbed for the new functionality. 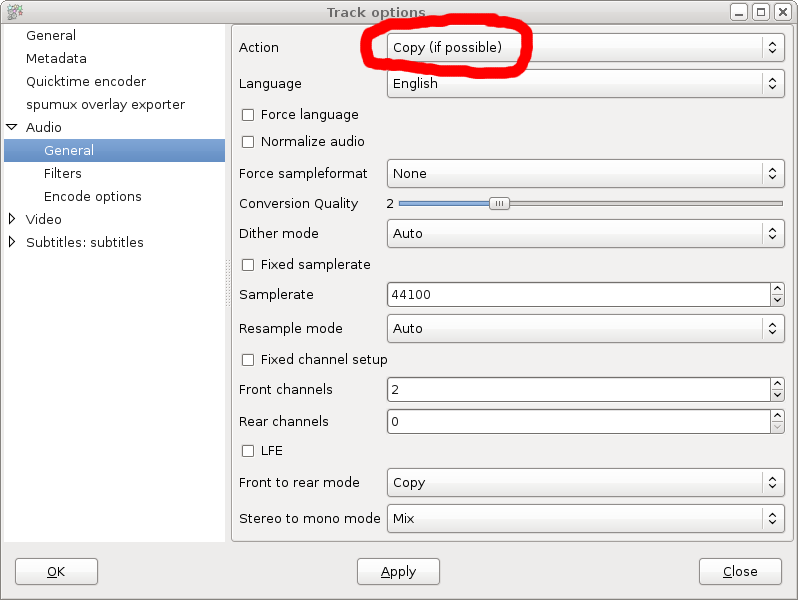 In particular you cannot copy some tracks while transcoding others. For more sophisticated tasks use gmerlin-transcoder or write your own tool. Most major codecs and containers work, although not all of them are heavily tested. Therefore I cannot guarantee, that files written that way will be compatible with all other decoders. Future work will be testing, fixing and supporting more codecs in more containers. Of course any help (like bugreports or compatibility testing on windows or OSX) is highly appreciated. With this feature my A/V pipelines are ready for a 1.x version now.